Salted Caramel – while the name evokes a gourmet treat (and it is) it always makes me want to snort just a little. Make caramel sauce and add a little salt. I know it’s fantastic, but people seem to just go nuts over the name! Anyway, salted or not, you just can’t beat a rich, luscious home-made caramel sauce. If you’ve tasted home-made side by side with store-bought, I don’t think you’d ever buy caramel again unless you needed a quick “save.” Basic commercial caramel sauce is a pale shadow of the real thing, and while some of the higher end ones are better (and more expensive) you can usually count on a few unsavory ingredients. A few seconds difference in cooking time can give you a range of color from a sweet, golden sauce to a deep, dark one with rich toasty notes, so it’s easy to make it just as you like. It’s also very easy to control the consistency; by adding more or less cream you can have a caramel sauce that drizzles beautifully or one that flows a bit slower. In the cheesecake photo, above, I used 1/2 cup cream. In a heavy, deep, medium-sized saucepan, add sugar, water and corn syrup. Place over medium-high heat and bring to a boil. Adjust temperature to keep at a moderate boil. There should be no need to stir, but before it comes to a boil it may be very gently stirred as it heats or the pan may be very gently shaken to swirl the sugar if needed while the sugar is melting, . Use a pastry brush dipped in a bit of water to wash down any crystals visible above the level of the sugar. The caramel will expand and as it cooks, then you’ll see the bubbles becoming smaller and the sugar darkening. Watch closely and have the butter and cold cream on hand. When sugar mixture reaches the desired color, immediately stir in butter as you remove the pan from the heat, then quickly add the cream. Be prepared for the mixture to boil up rapidly. Add flaky salt at this stage if you wish it to be completely dissolved. Stir with a whisk until the caramel reaches a smooth consistency. If you note any lumps that aren’t dissolving or any sugar sticking to the pan, replace pan on the still warm burner while continuing to stir. Any small streaks will even out as the caramel cools. If you wish to see small bits of salt in the caramel, add granulated sea salt just before serving. So stop by and see what all the fun is about!! Visit, mingl, comment and share! It’s a party, after all! 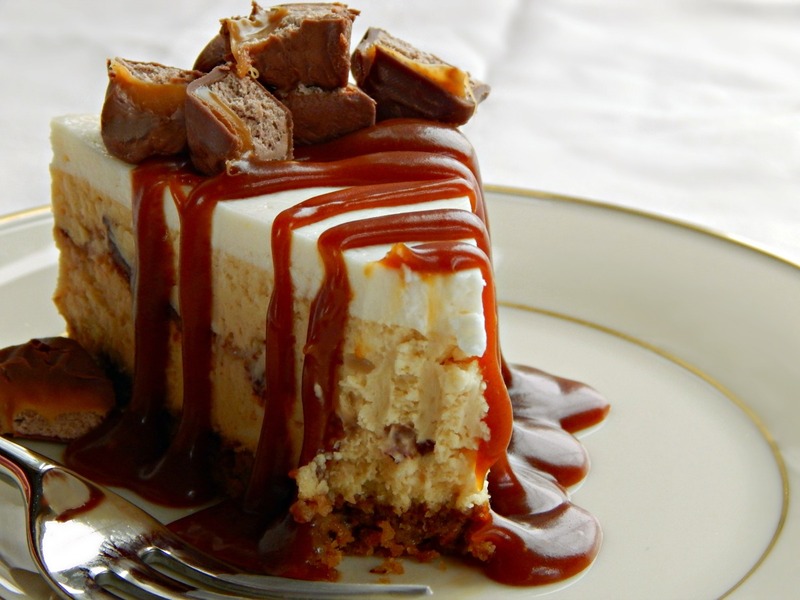 Here’s the link to Caramel Toffee Cheesecake! This entry was posted in Click here for Fabulous Food Posts and tagged Caramel, caramel sauce, corn syrup, Cream, Dessert Sauces, Desserts, fleur de Sel, Sauce. Bookmark the permalink. Thanks so much! 🙂 You made my day!! I just made a big batch this weekend. Love it. And yes, you really could give it as gifts. I just do sugar, butter, cream, and it’s a dream. So simple! I did that one year, jarred up in cute jars my hot fudge, caramel and another sauce, can’t remember which one and gave as gifts with ice-cream dishes. It was a hit! We went through it all and I made it twice – am still hoping to get a photo of it being drizzled over ice-cream!! 🙂 Guess I’ll have to make some more!! Merry Christmas – and what’s your fave Christmas movie this season?? You aren’t kidding about the hot caramel… you’d think you’d learn the lesson after one burnt mouth experience, but it just looks so inviting! It’s a keeper and great for holidays, too! Pin it! 🙂 And thanks for the comment! Merry Christmas! Mmmmm love salted caramel. Looks fantastic. I love (salted) caramel. A jar of this sauce kept in the fridge at all times is a great way to dress up a bowl of plain ice cream, crepe, plain piece of cake or cupcake. Or even dip fruit into. Wow! This looks so scrumptious! I love salted caramel…can hardly wait to try it. Pinned! Thanks, Susan, and thanks for the pin! Hope you love it! Oooooo, look at that, all my favorite ingredients in one sitting! Wonderful!